The Israeli cabinet has endorsed a UN Security Council resolution calling for an end to fighting in southern Lebanon. A ceasefire between Israel and Lebanese militant group Hezbollah is due to come into force at 0500 GMT on Monday. Israel says its forces will not leave southern Lebanon until peacekeepers are deployed in force, and Sunday saw more heavy fighting. A Lebanese cabinet meeting to discuss the disarming of Hezbollah under the ceasefire has been postponed. "Hezbollah had some observations over... the discussion of their disarmament," a government source told Reuters news agency. Hezbollah, a member of the government, says it has the right to continue attacks until the last Israeli soldier has left Lebanese soil. Mark Malloch Brown, UN deputy secretary general, has told the BBC it may take a month before the UN-Lebanese force is fully in place. "It's going to be weeks, not days and may even, before you hit the full total, be a month or so," he told the BBC's Have Your Say. "That's how long it will take to get this full armament in place"
At least 13 Lebanese people, including a mother and her three children, were killed in Israeli attacks on Sunday, Lebanese officials say. A Hezbollah rocket killed a woman in Israel, Israeli emergency services say. 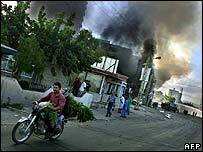 Israeli planes bombed petrol stations in the southern Lebanese city of Tyre, sending up thick clouds of smoke. The BBC's Jim Muir described a crescendo of violence in the hills near the city as Israeli shells, bombs and rockets smashed into their targets. The sound of huge explosions reverberated across Beirut as the Israeli air force carried out a new raid on southern districts of the city. Rescue workers said that several multi-storey buildings had collapsed. 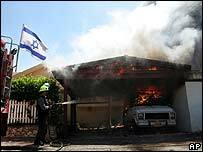 Hezbollah guerrillas had fired more than 150 rockets into northern Israel by mid-afternoon, killing at least one person in the town of Yaara and wounding several in Safed. Haifa's city centre also came under bombardment from rockets. Israel's cabinet voted 24-0 with one abstention to accept the UN resolution, which earlier won the Lebanese government's approval and qualified support from Hezbollah leader Sheikh Hassan Nasrallah. Foreign Minister Tzipi Livni later stressed that Israeli forces would not leave Lebanon until the international force had been deployed. "We desire... to leave parallel to the move south of the international forces with the Lebanese army," she told reporters. There would not, she said, be a scenario "where we see that a Lebanese army soldier has arrived and now they tell us to leave". The BBC's James Reynolds says that what will happen before the Israeli withdrawal is a very big unanswered question. Australian Prime Minister John Howard has said he has serious concerns about whether the ceasefire will last unless Hezbollah is disarmed. 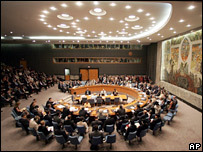 The UN Security Council unanimously adopted the resolution, designed to end four weeks of fighting, on Friday. UN Secretary General Kofi Annan said he was "very happy" with the truce but added that "preferably, the fighting should stop now". He insisted that the UN would work with the Lebanese and Israeli governments to ensure the ceasefire held. The truce has been welcomed by Iran, one of Hezbollah's main supporters, though it described the resolution as unbalanced because it failed to criticise Israel for its actions in Lebanon. Sheikh Hassan Nasrallah said on Saturday that Hezbollah would abide by the resolution but had a "natural right" to confront Israeli forces "as long as there is Israeli military movement, Israeli field aggression and Israeli soldiers occupying our land". Some Israeli estimates put the number of Israeli troops now in southern Lebanon at 30,000. The Israeli army has confirmed that 24 of its soldiers were killed on Saturday - its highest number of casualties in a single day since the conflict began. More than 1,000 Lebanese and more than 120 Israelis have been killed in the conflict since Hezbollah militants captured two Israeli soldiers on 12 July in a cross-border raid.